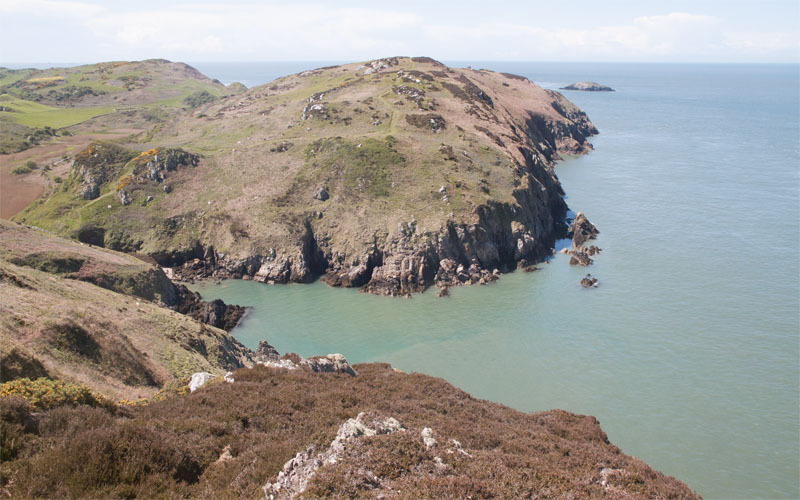 Maps: OS Explorer Map (262) Anglesey West. 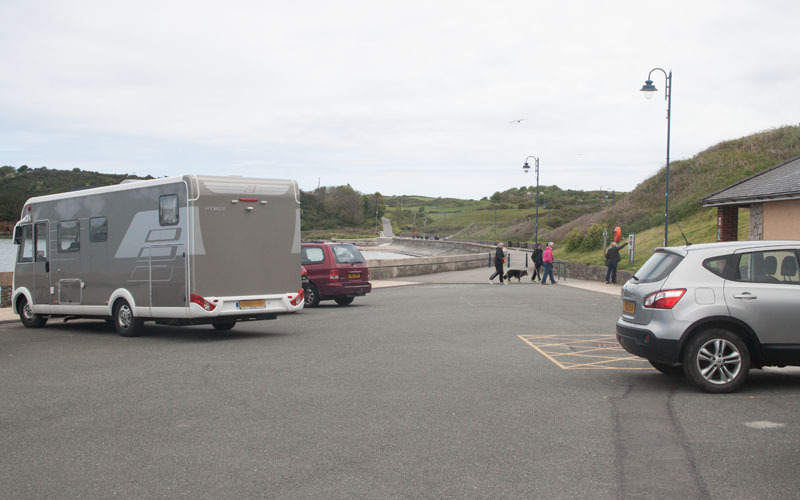 Start & Finish: SH 373 935 - Cemaes Bay Beach Car Park. 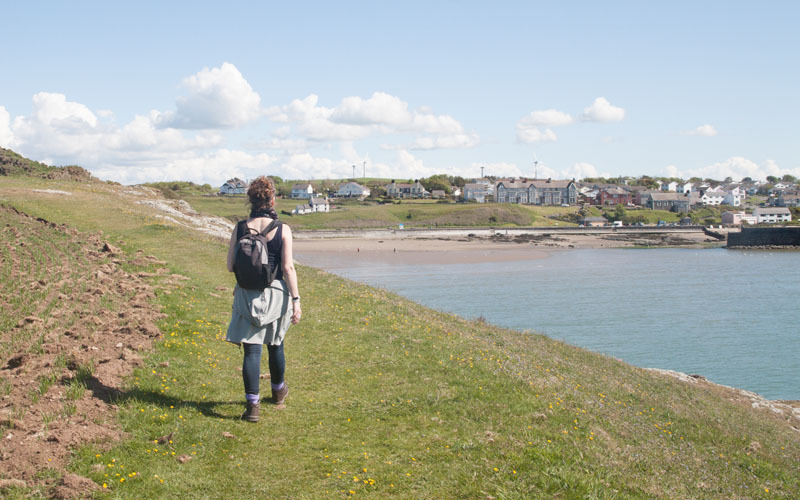 Route: There's some stunning scenery on this walk - and also some sheer drops from high cliffs! 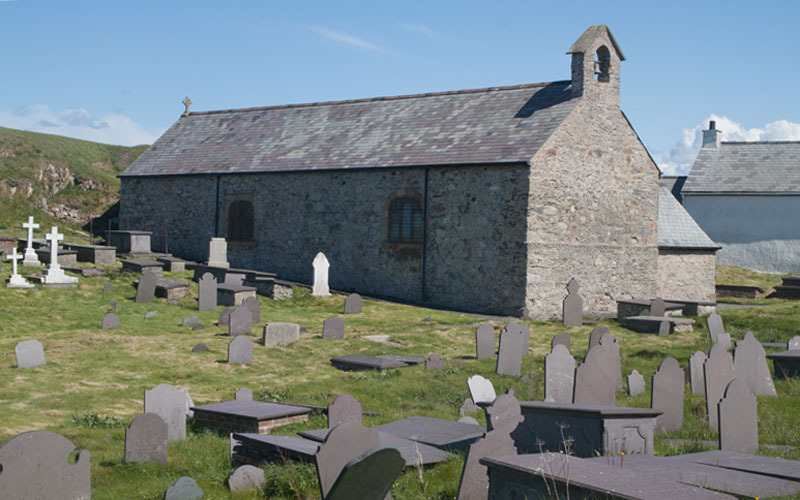 The walk includes industrial archaeology and passes a historic church. 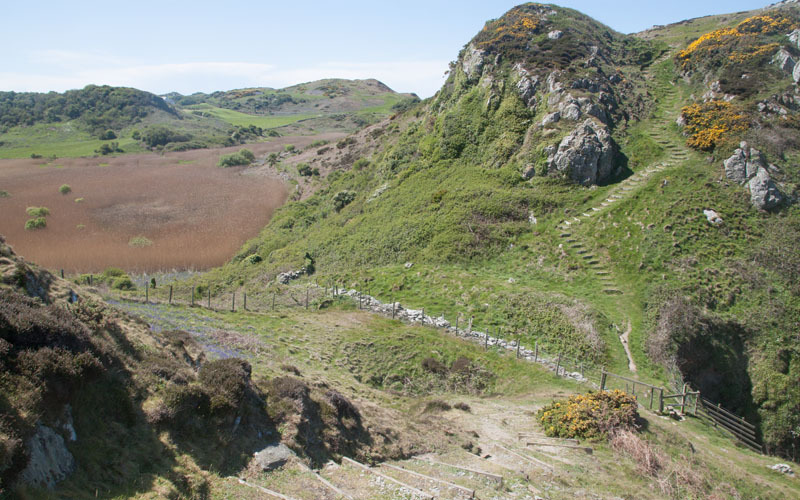 The coastal stretch of the walk has a number of steep, stepped sections (the highest point is only about 80 metres above sea level - but the total ascent is over 730 metres). 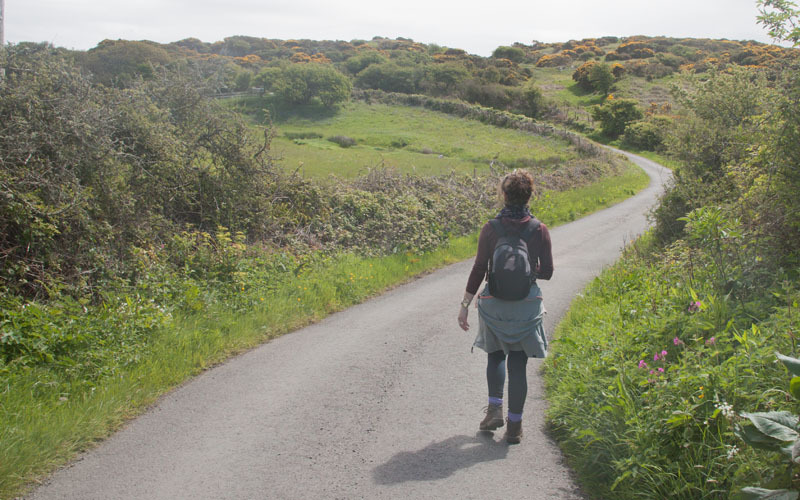 Stretches of the walk are along single track roads, but most of the route is along the coastal path. There are suggestions for both shortening and extending the route. Refreshments: Pubs and cafes in Cemeas - nothing on the route I'm afraid. 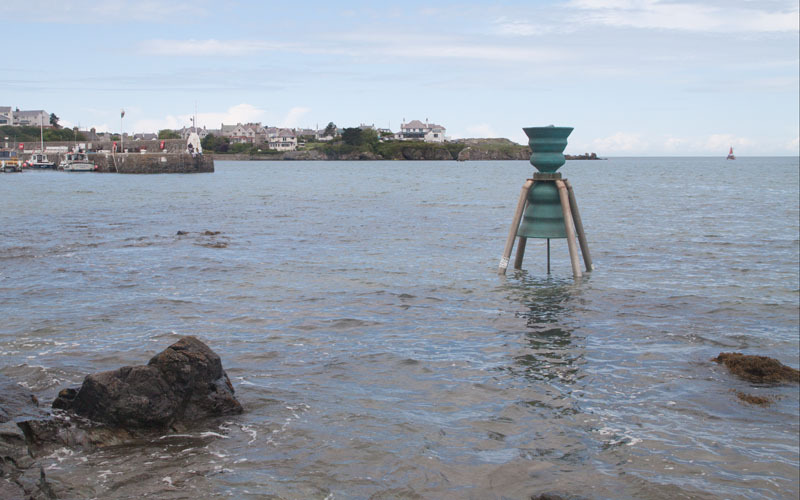 … passing St Patrick's Bell, one of more than half a dozen Time and Tide Bells around the British coast. 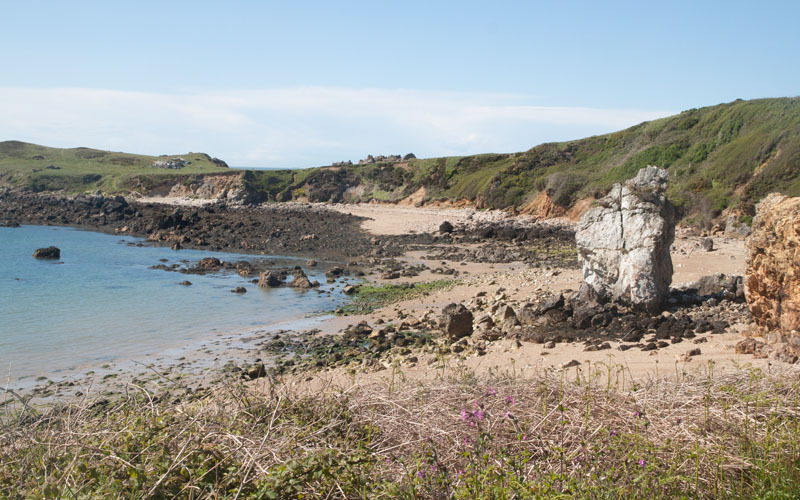 Walk across the car park at the far end of the beach and follow the single track road for about 500 metres. 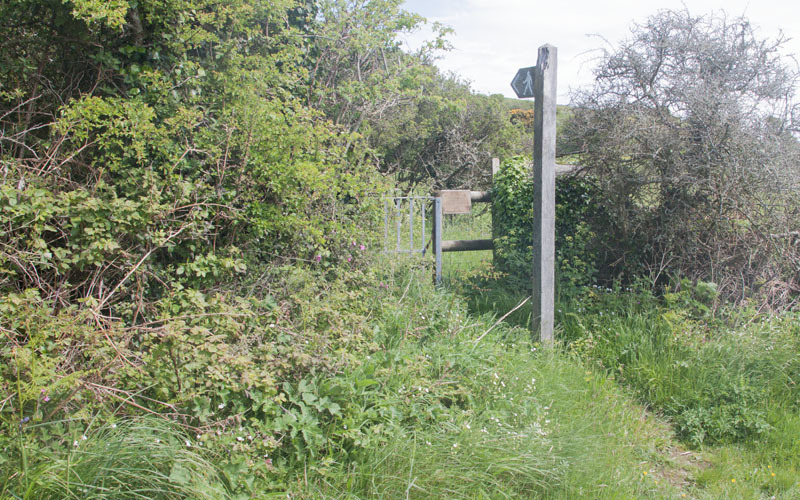 … and after a short distance go through a rusty gate to follow the footpath on the left. … a lawned area with a few bushes. 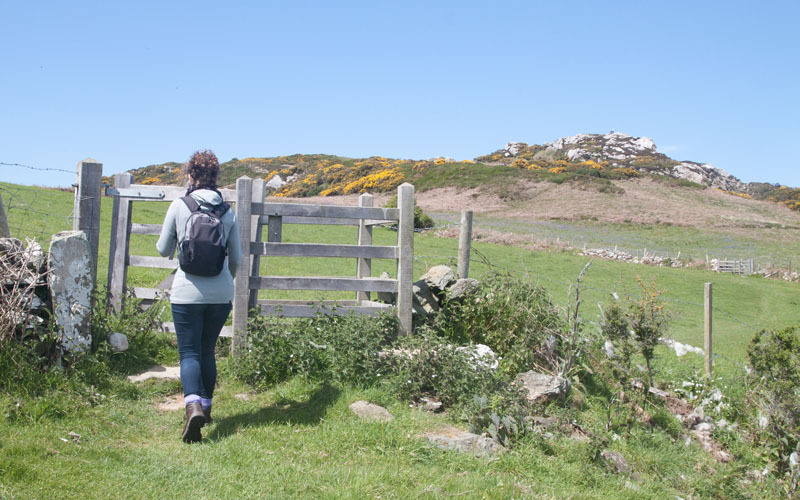 The next gate leads into a field, then another gate. 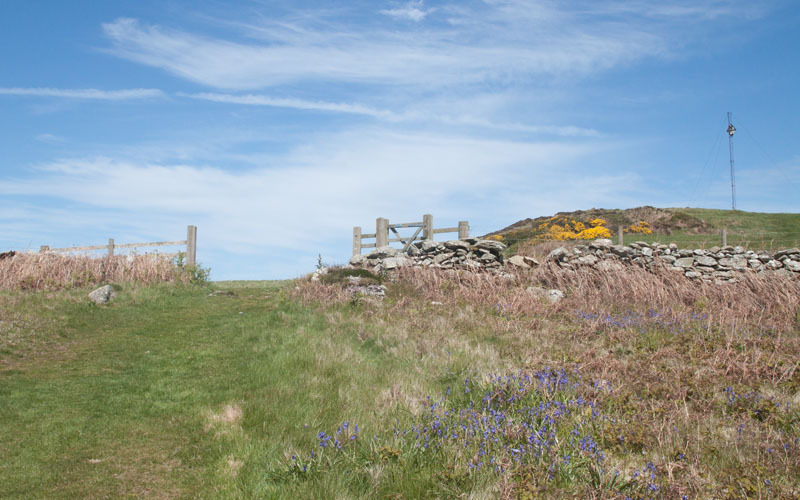 … a stile leads on to a single track road. Turn right. 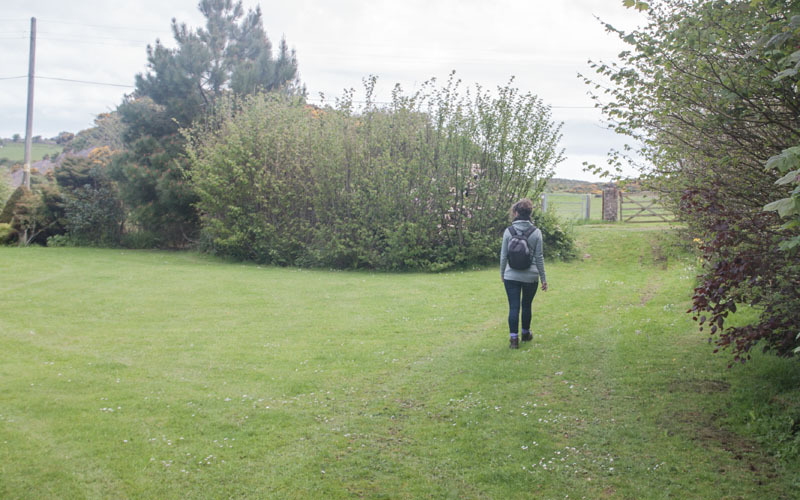 … to where there are 2 paths leading to the left. 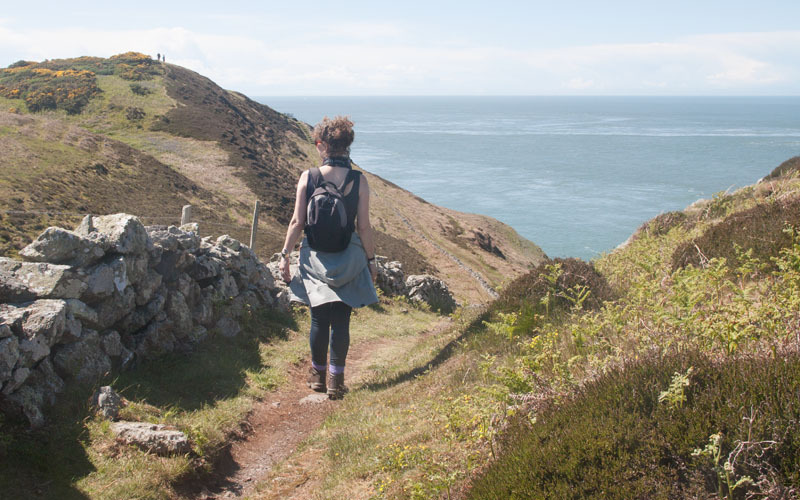 We followed the 2nd of these (the first is a slightly shorter route which also leads to the coastal path, but you would miss out on the spectacular first views of Porth Wen). … and head slightly to the right. 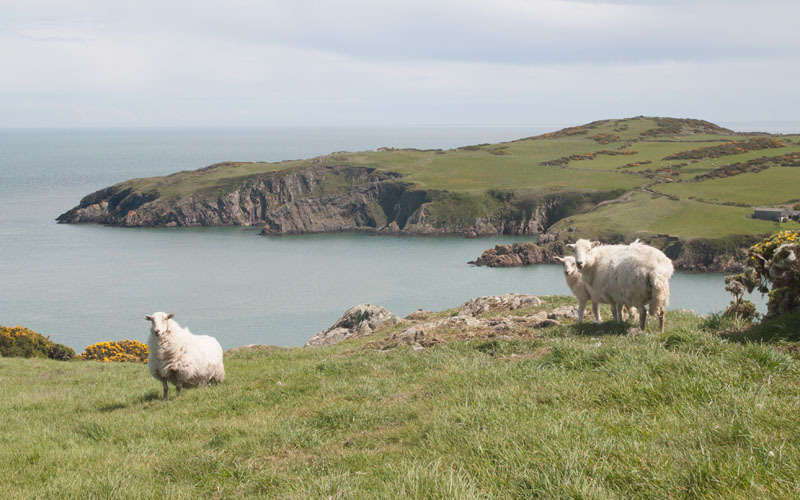 From the highest point in this field you get the first view of Porth Wen. 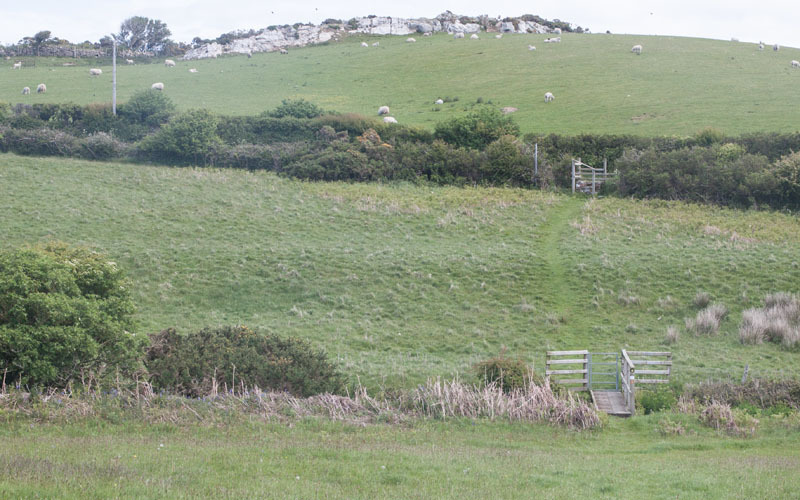 A 3rd kissing gate (this time in a low stone wall) leads into another field. A marker post ahead indicates the route. 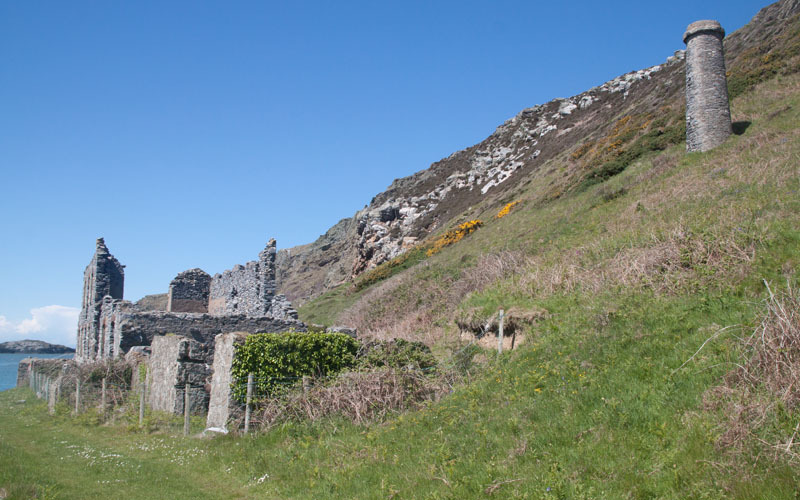 Before you reach yet another kissing gate (this time a rusty metal one), you will have a glimpse of the ruined buildings at Porth Wen. 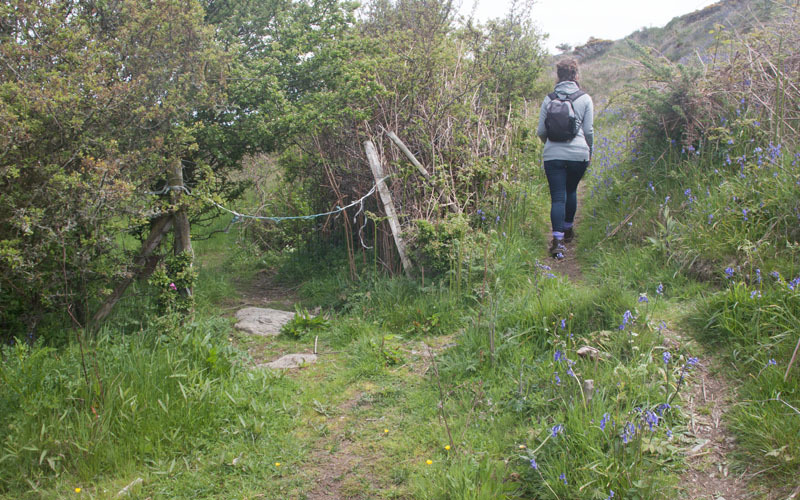 A steep path (with steps) leads down to the coastal path. Turn left onto this. 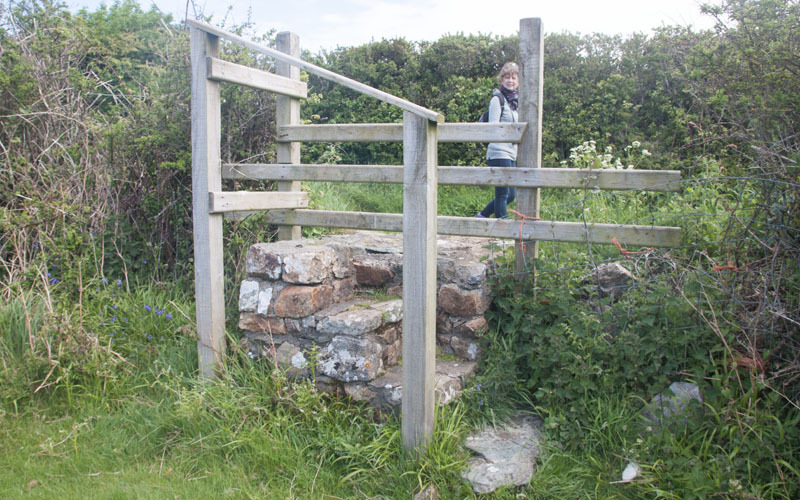 … a couple more kissing gates, following the coastline to the right before you meet a junction of paths. 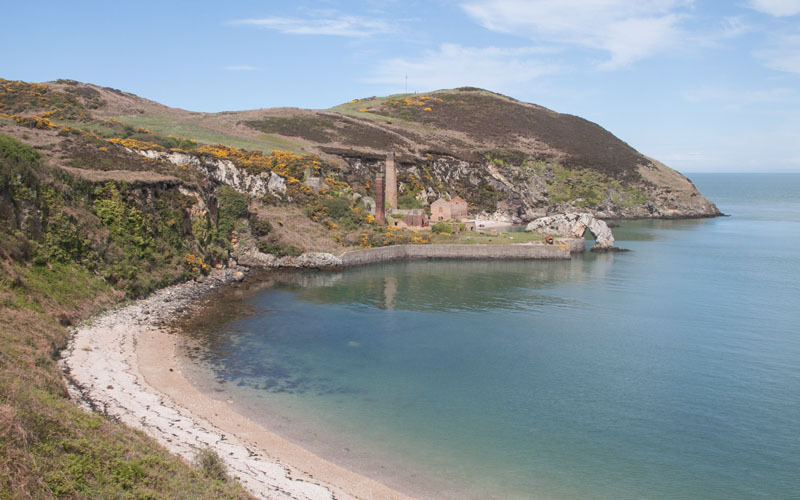 Go straight ahead to follow the coastal path - or turn right to explore the derelict brickworks. 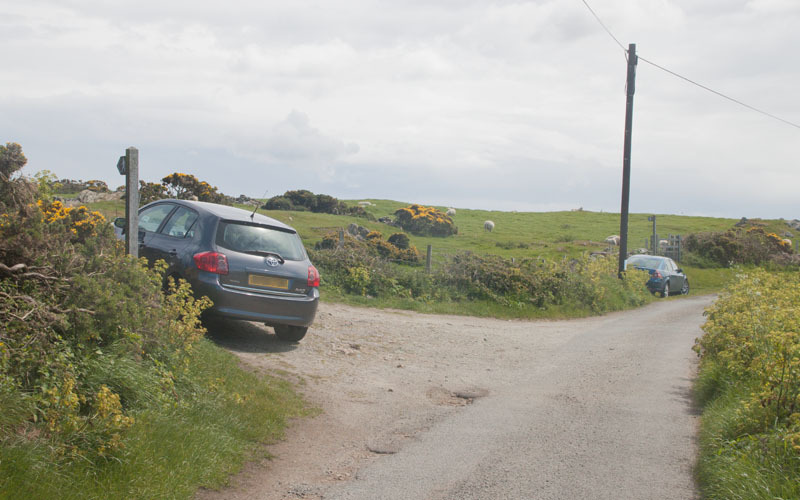 … turn right to pass through the metal gate pictured and descend between tall gorse bushes. 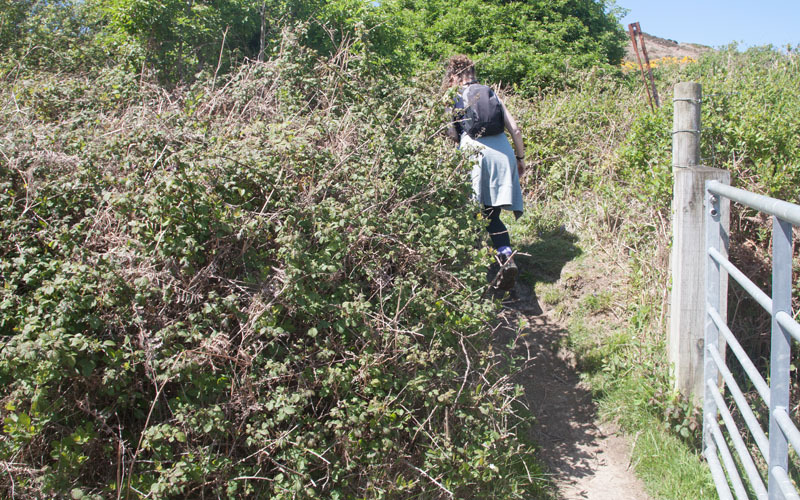 There was a point just above the brickworks where the path had given way - and extreme care is needed from this point on. 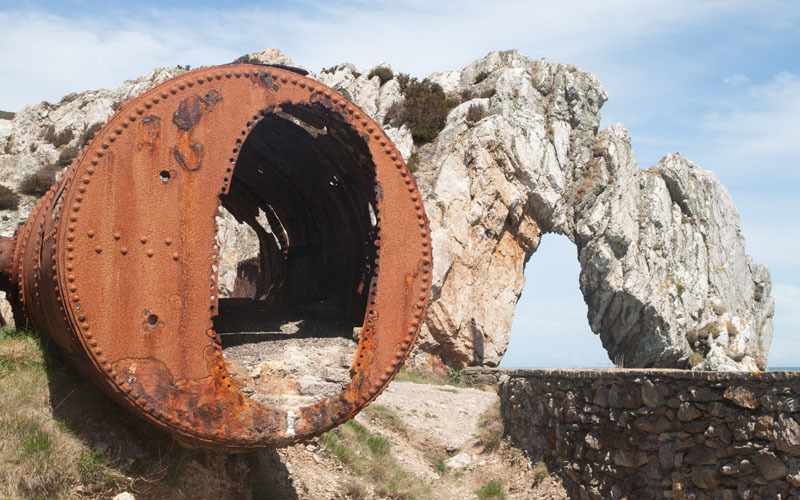 We found the ruins fascinating - especially the contrast between the decaying human artefacts and the natural formations. Once we had finished exploring we climbed back up the path to the metal gate. 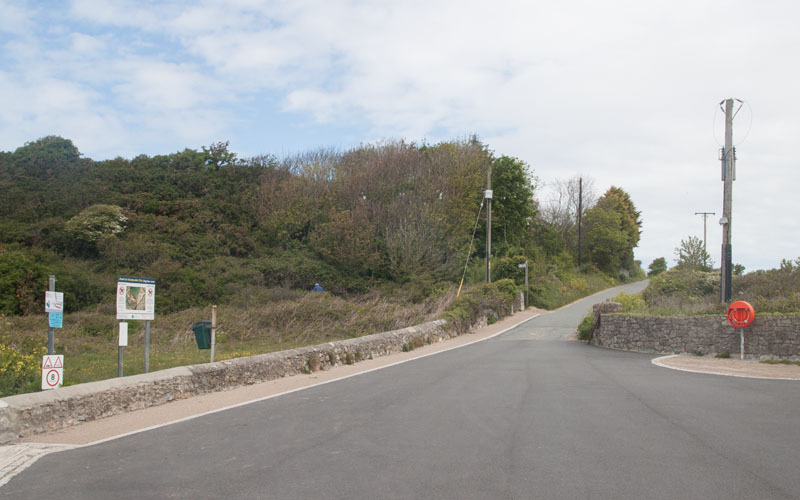 Turn right immediately after the gate and continue uphill to rejoin the coastal path. 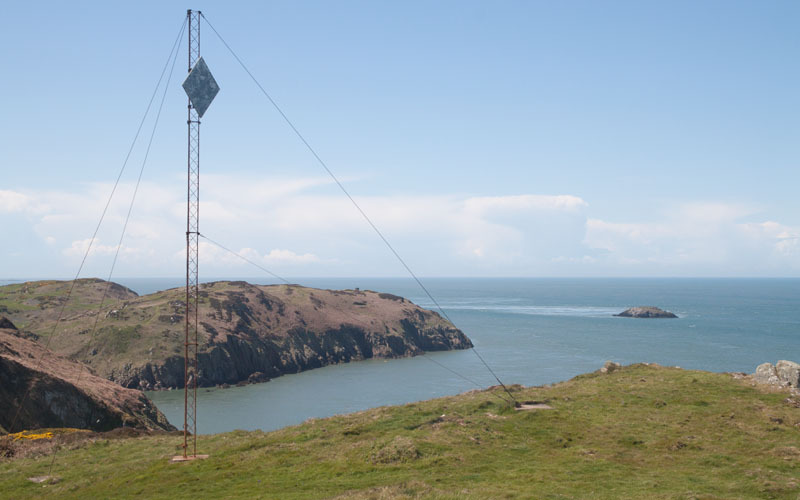 … and walk up to the highest point on the headland. 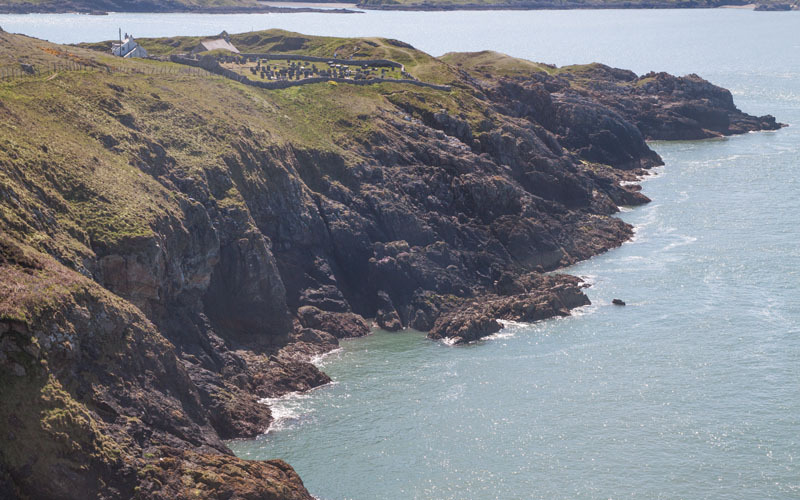 This provided splendid views over the sea to Ireland and, in the other direction, across the island to the mountains of Snowdonia. Middle Mouse is the small island in the picture. 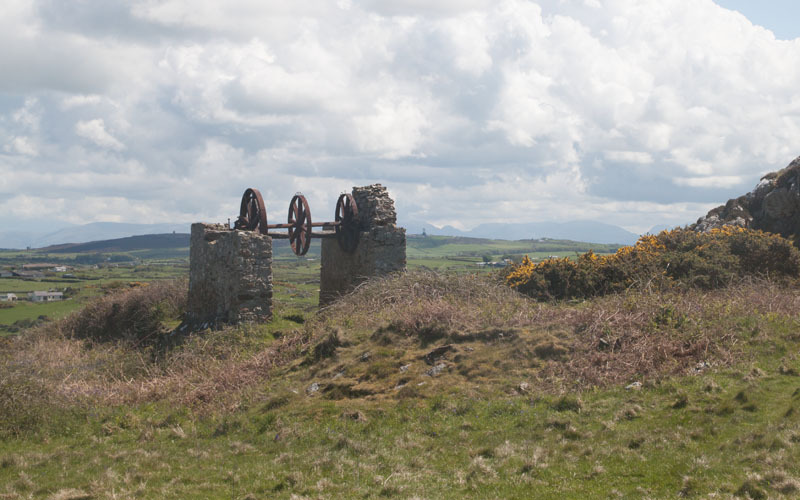 … before taking another short diversion to the left to examine the wheels of the tramway used to transport raw materials from the nearby small quarry down to the brickworks. 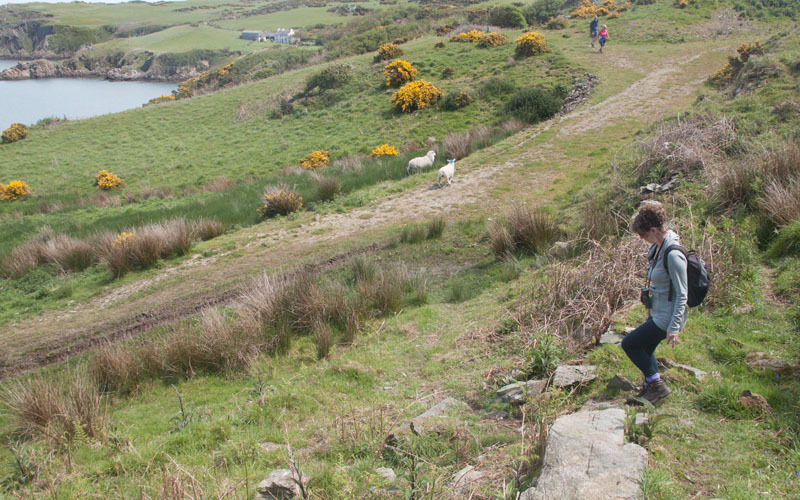 The next section of the path is above one of the steepest drops down to the sea! 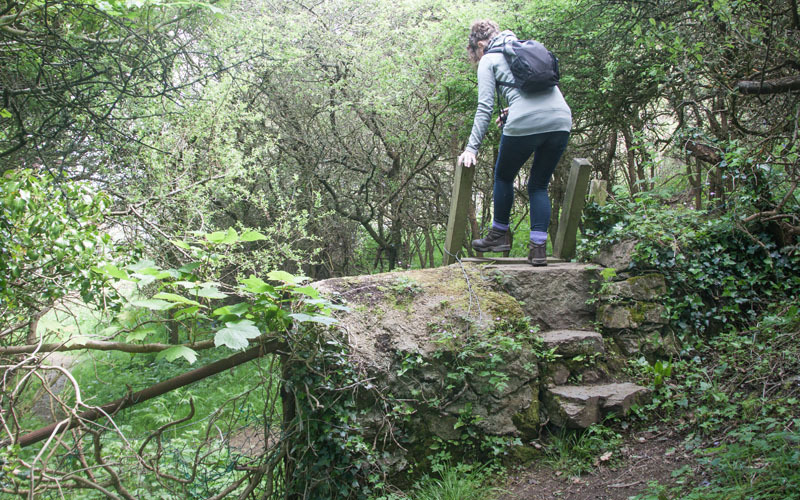 The path leads down steps to a stile before climbing steeply up a zig-zagged, stepped path. 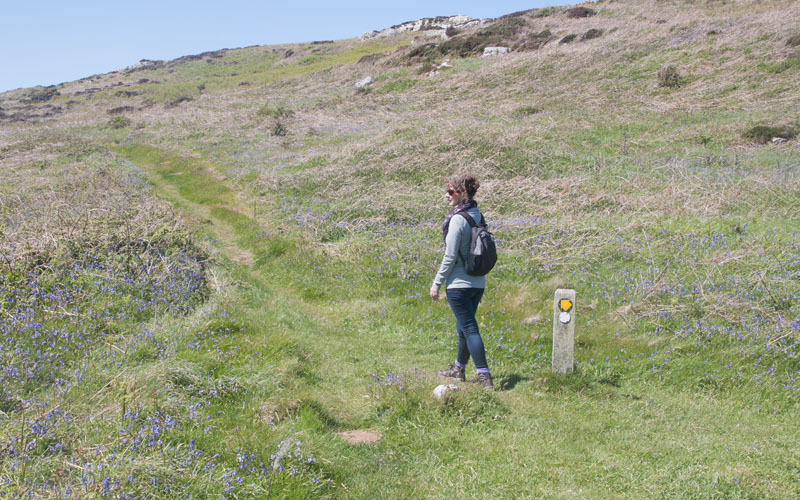 At the marker pictured there is another choice: up to now we had always chosen the longer options, but here we took the shorter route to the left (the right hand path leads round the headland where there is a tower built to commemorate the coronation of Edward VII in 1902). Where the path next divides we took the path to the right which leads to the derelict porcelain works at Porth Llanlleiana. 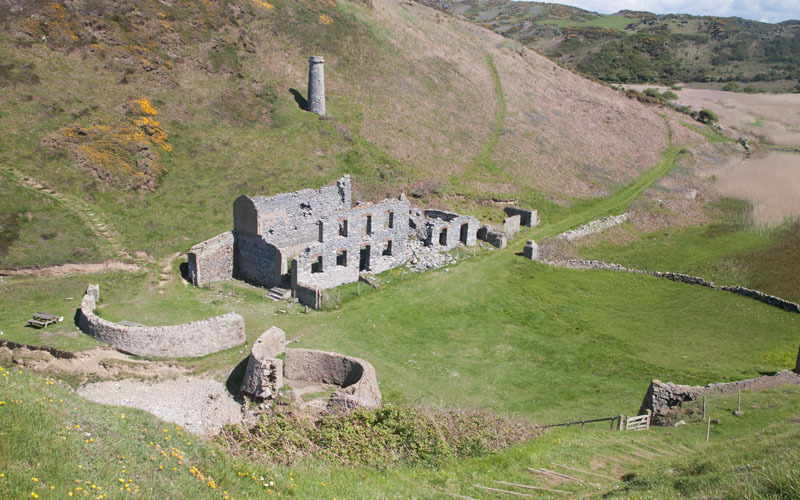 Although much smaller than the brickworks at Porth Wem, this is fenced off, so it's not possible to explore. The rock and shingle beach did provide a convenient place to stop and recharge before climbing the steps to the west. Go through the gate and continue up yet more steps. The path levels out for a short distance, before leading up still more steps (stopping and looking back to take this photograph gave me an opportunity to catch my breath). 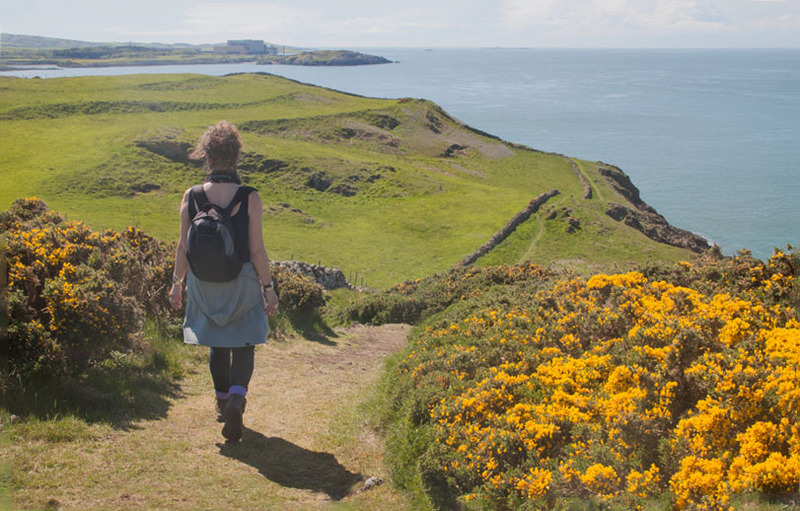 … before you start to descend - and you catch the first view of the former nuclear power station at Wylfa. 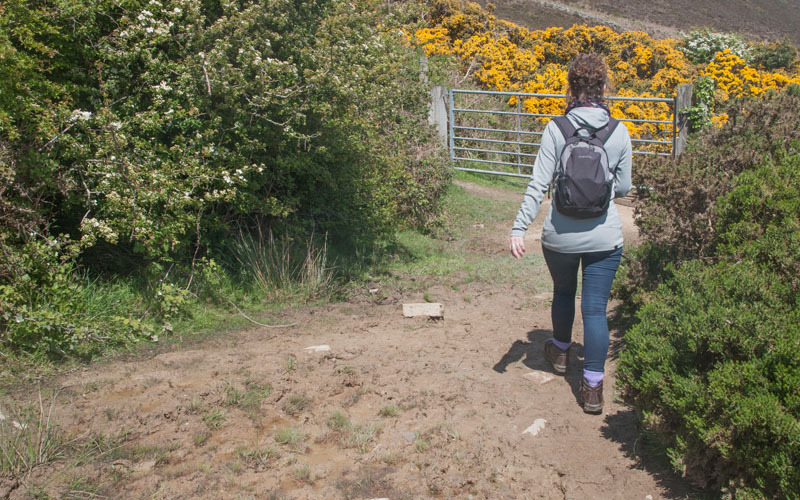 There's a fair length of path along the clifftops before you have climb any more steps. 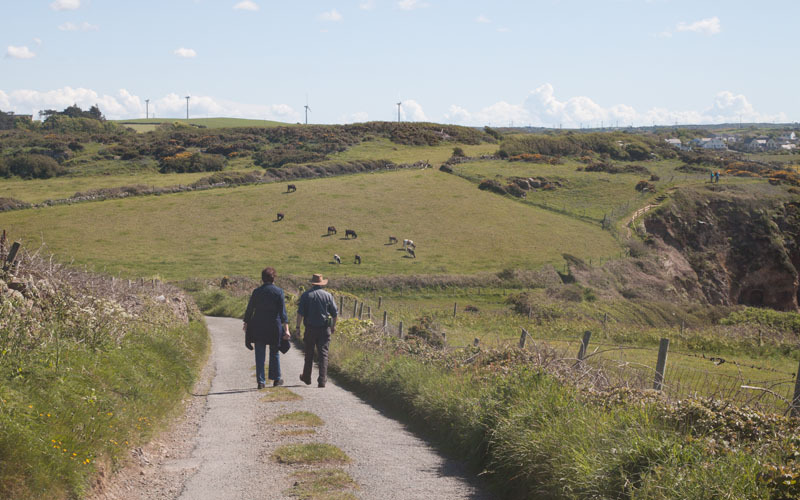 … but decided instead to follow the road from the church. 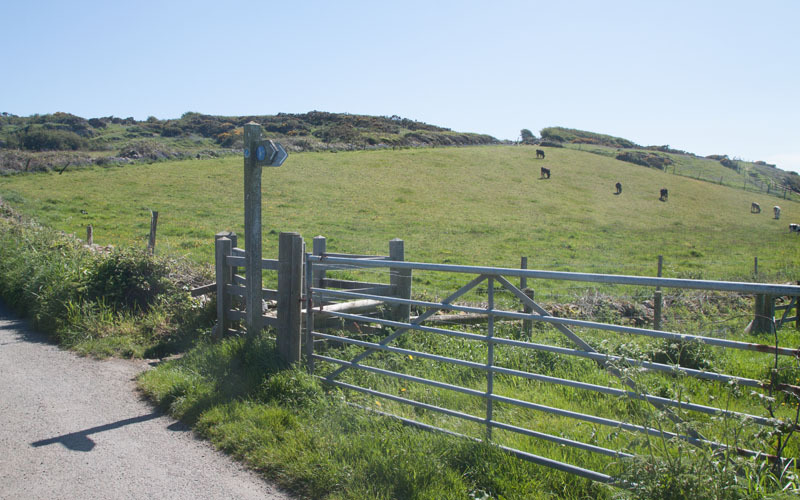 After walking for about 120 metres along the road follow the footpath through a kissing gate on the right. 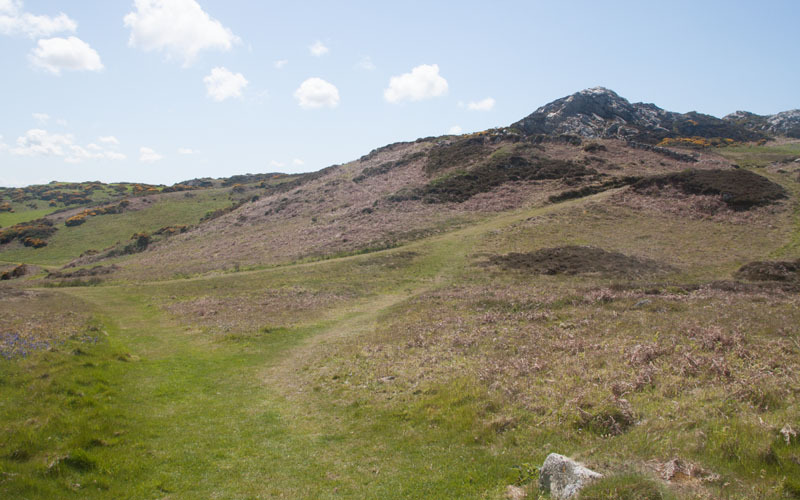 The path leads round the edge of Porth Padrig beach with its quartzite stack (the White Lady). 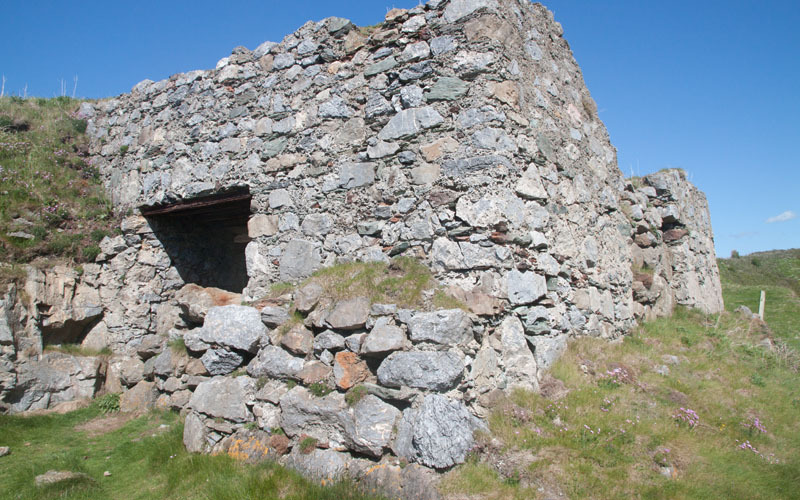 ... pass this ruined lime kiln, before ascending a few steps up to a kissing gate. 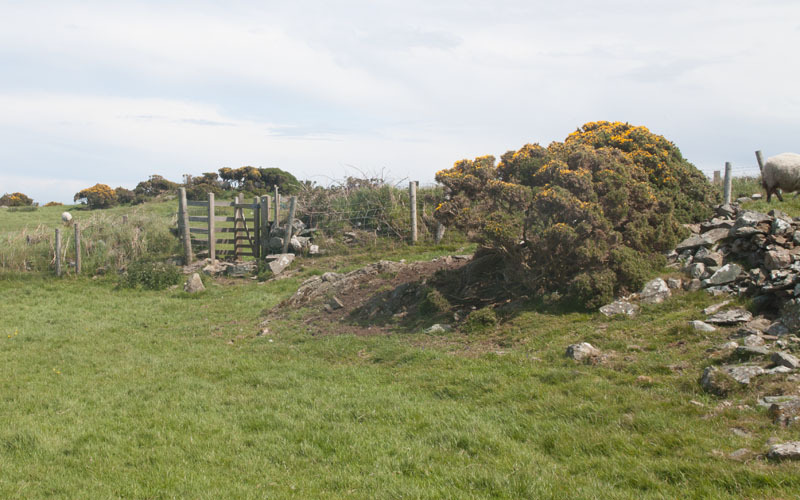 The path runs between a field (recently sown when we walked in May) and the clifftop, then between gorse bushes. 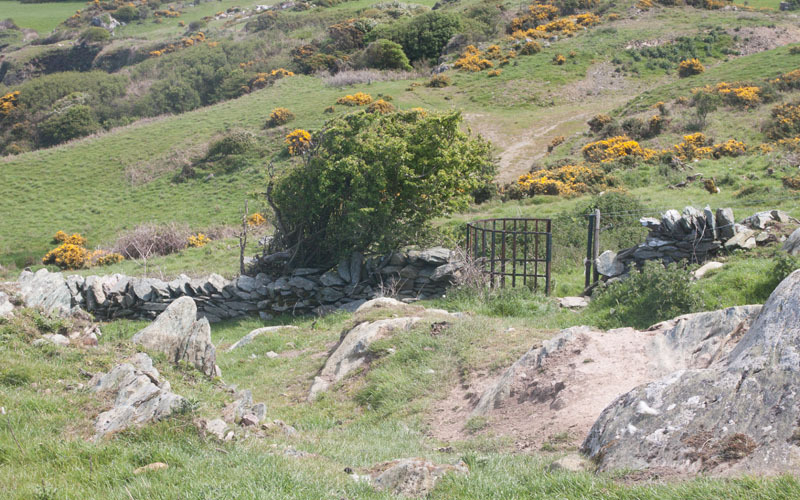 A kissing gates leads to a narrow path with a post and wire fence on the left and bushes on the right. 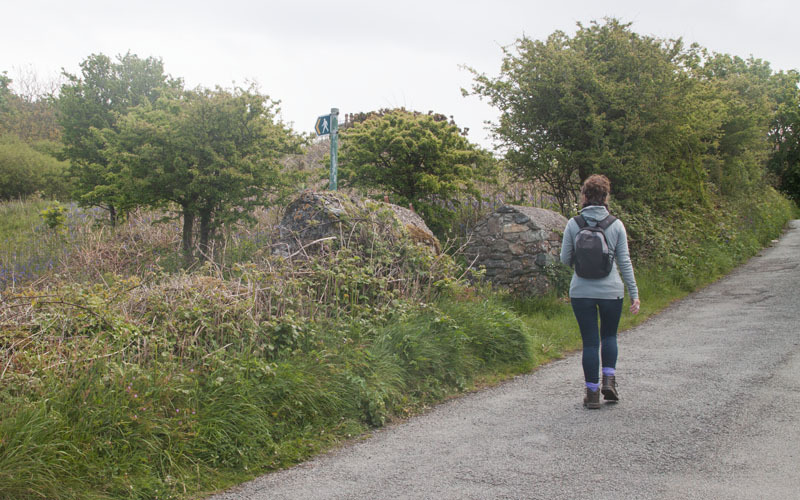 Continue to follow this main path which emerges on the road near the car park at the north eastern corner of Cemaes Bay. Return to the start either along the beach or the pedestrian roadway.